Colleen can be credited with introducing me to great pizza. Coming from the suburbs of Maryland I was used to eating Papa John’s, or on a good day Ledo’s (a regional chain). New Jersey, on the other hand, is rife with top-notch pizzerias. When we moved to Brooklyn, we were quite optimistic about finding great, affordable pizza within walking distance. We didn’t, and that brings us to where we are today. A typical pizza for our apartment’s pizza night. After a few wandering attempts, I nailed down a dough recipe that produces a flavorful crust that can go cracker-thin or thicker with less density but just as crisp. For toppings I settled around mushrooms, onion, green pepper, fresh basil, fresh mozzarella (of course), and the occasional marinated seitan. So far I’ve been baking on cookie sheets and pizza pans at 475 degrees (up from my previous 450) with a 7 minute pre-bake before topping. My brother tells me that a pizza stone is essential, but my results thus far have been quite good. Nonetheless, I’d love to experiment with a pizza stone and higher temperatures. Of course, there are many variables at play, and changing the baking conditions may necessitate further changes to recipes. But for the time being (and without further exposition), let’s get to them! This recipe makes between two and three crusts depending on what size pizzas you are making, the thickness of your desired crust, how much you allow the dough to rise, your refrigeration of the dough, etc. There’s not much that’s special to the process. In a large bowl, dissolve the sugar into the warm water, and add the yeast. I like to stir the mixture a bit to distribute the yeast, but it’s not necessary. After 10 minutes the yeast should have produced a bit of foam on the surface of the water. Add the olive oil, salt, and herbs and give the mixture a stir. Stir in the flour until it’s starting to thicken up and it’s hard to work with a spoon. Flour your hands with loose flour in the bowl, and continue working the rest of the flour into the dough. I like to use one hand to do this while using the other to control the bowl (and add more flour to the dough or my hand if needed). With sufficiently floured fingers you can also scrape any remnants of dough off of the spoon. Around the time there is little flour left to work in, the dough should be pliable and elastic without sticking much to your hand. If it sticks a little, that’s fine – I like to get it to the point where it separates from my hand with only the aid of gravity. Cover the bowl and set it somewhere to rise. I like to stop up the sink and put the bowl into a bath of warm water. Once the dough has risen (I leave it be for an hour), punch it down. You can use this dough to make pizzas right away, you can store it in the fridge for a few days, or you can freeze it. I’ve done all three with good results, and often make dough the day before I plan to bake, freezing leftover dough after I am done baking. Either way I put a bit of oil on a baking sheet and rip off a hunk of dough to be rolled out into a pizza. The exact size of the hunk is hard to nail down. I’d say slightly larger than softball sized for a 14″ thin crust and more for a thicker crust (for a thick crust I tend to use close to half of the total dough yield). I simply mix it all into a pot and heat it to a lower simmer, which kind of a weird concept for a sauce this thick. If you stir it and vapor comes out like it was previously under pressure in the sauce, that’s what you’re aiming for. This recipe is more or less the marinara recipe from The Grit Cookbook with tomato paste added to make it much thicker. The Grit is a vegetarian restaurant in Athens, Georgia that has delicious everything, and while sometimes their recipes can be a little more work (if only to hunt down nutritional yeast and vegan Worcestershire sauce), it has always proved to be worth it. I’d recommend the book to vegetarians, vegans, and non-vegetarians alike. Usually after the 7 minutes pre-bake at 475 degrees F, I remove the crust, sauce it, and then place the toppings. I put the pizza back in and simply monitor its progress to decide when to remove it. I look for a thoroughly browned crust and slight browning of the cheese, but sometimes I take it out a little earlier. The last round of pizzas I made were unusually floppy in the middle. I think this was due to overloading the pizzas with toppings and unusually watery sauce. I also sometimes add a little balsamic vinegar towards the end of the bake, which may have also contributed. I made the pizzas using dough and sauce that I moved into the refrigerator the day before to thaw and then moved to the counter to come to room temperature one hour before baking. I don’t know if something in the freezing and/or thawing process contributed, but since I’d done this before without issue I think freezing wasn’t responsible. In any case, I don’t want a repeat of my previous performance, and so will be experimenting with different topping practices as well as higher baking temperatures and new baking surface. 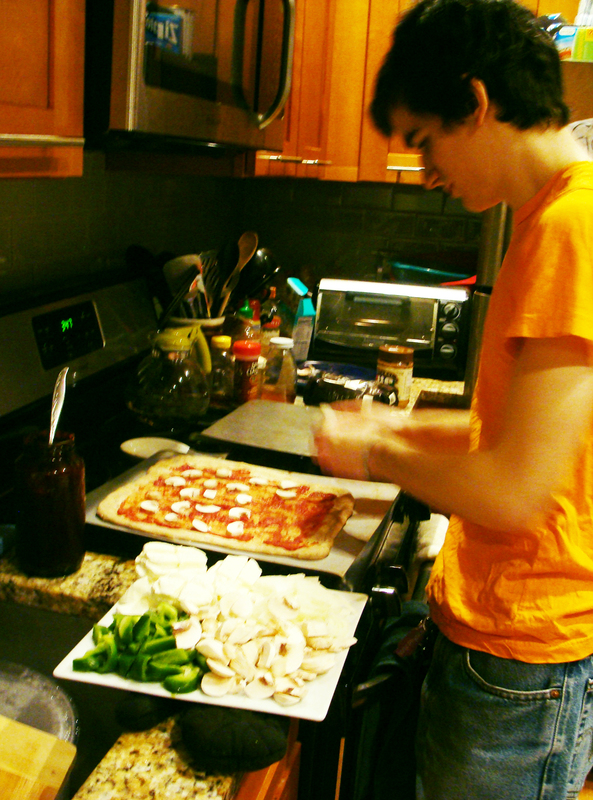 This entry was posted in pizza, recipes on February 1, 2013 by Dylan Bargteil.